Corporation Habanos s.a. launches the Limited Edition 2006 for the world market. Havana, June 19th, 2006. On the occasion of its V anniversary, Habanos s.a Corporation has started the commercialization of the 2006 Limited Editions through out the globe. A fair homage to the most successful ones in the history of the concept: Cohiba Pirámides, Montecristo Robustos and Partagás Serie D n 3. These three items will be carrying commemorative sticks and vitolinas. Since the year 2000, Habanos s.a. Corporation has released 24 of these special cigars under the most prestigious brands of our portfolio such as: Cohiba, Montecristo, Partagás, Romeo y Julieta, Hoyo de Monterrey Y H. Upmann. The Limited Edition distinguishes itself for the inclusion of sizes which are not part of the usual range of the brand, and is characterized by a special manufacture. The careful selection of a two-year aged wrapper from the upper level of the plant grants it a darker color and turns this product into something unique. Next year, the binder and filler leaves used for the making of the Limited Editions cigars will be aged as well turning these smokes into something far more great. Habanos s.a. has decided to maintain in 2006 the aging only of the wrapper leaves for reproducing the exact features of those issues back in the days they were first released. Another thing to take into consideration is that the packaging will be different than the original. Cohiba Pirámides (52 x 156 mm) Cigars will be packaged in a special dark case with brooch, exclusively designed for this occasion and comprising 10 units. Montecristo Robustos (50×124 mm) Cigars will be packaged in unvarnished Semi Boite Nature Boxes with brooch comprising 25 units. Partagás Serie D No.3 (46x143mm). A selection of 25 Coronas Gordas presented in Semi Boite Nature Boxes with brooch. 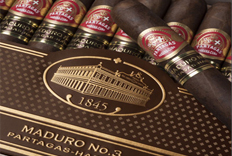 It already started the commercialization of the Partagas Serie D No. 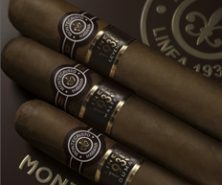 3 and Montecristo Robustos through all the markets. Meanwhile Cohiba Pirámides will be available in September.